Who Was the First Scalp Micropigmentation Company in the USA? Who Started Scalp Micropigmentation in the USA? Home » Blog Collection » Who Started Scalp Micropigmentation in the USA? The field of scalp micropigmentation can be a dirty business, and Mark Weston has seen this industry develop first hand since his inception of Artistry Concepts. 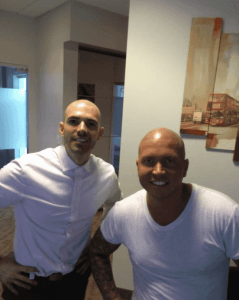 Many of you have probably not heard of Mark Weston, even though Weston has been in the scalp micropigmentation business since early 2009 before any of the companies out there. The dirty “underground” of this business has always remained very low-keyed but aggressively cut-throat. This article will shock you about what you thought you knew about various scalp micropigmentation companies and how they arrived at where they are in this industry. 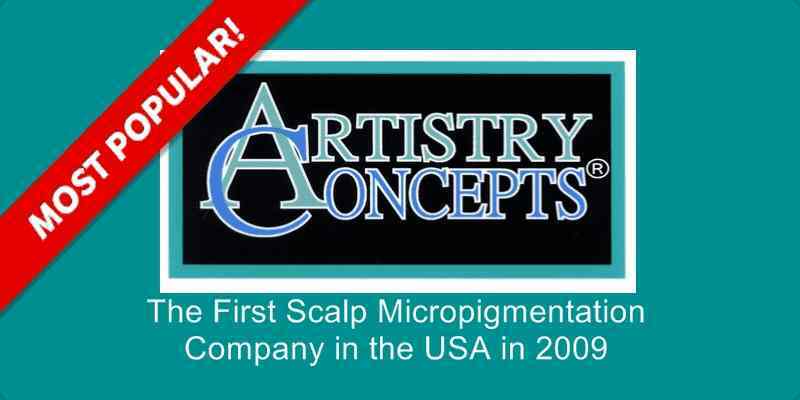 This blog article will give you accurate information about who was in fact the first scalp micropigmentation company in the United States, ARTISTRY CONCEPTS. There will most likely be some retaliation from these companies for bringing to light this information. Just about every website of every provider out here claims they were the “inventors,” “innovators,” “creators,” “pioneers” or various other synonyms. Other individuals claim that they were “trained” by the “inventor” of scalp micropigmentation. So let’s cover some actual history here as Weston and Artistry Concepts have been around since the onset of this industry and have personally seen when and how various companies got their start. Take into consideration these company’s false claims if you may be considering their services. 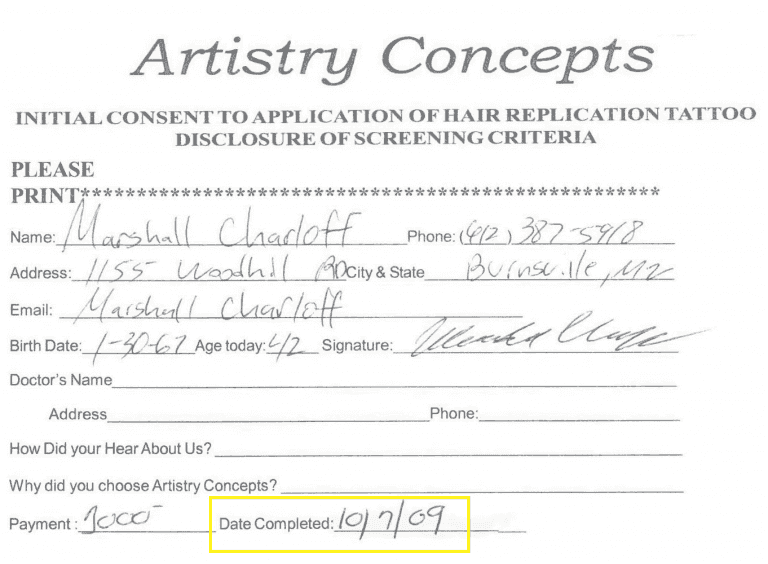 Matt Lulo of Scalp Micro USA (formerly of HIS Hair Clinic) is erroneously advising clients that he and HIS entered the USA scalp micropigmentation “years before” Artistry Concepts. But as can be seen from their own website page, they entered in late 2011. 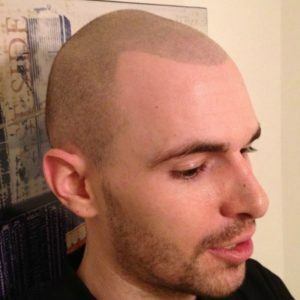 HIS HAIR CLINIC was the first to offer a form of shaded scalp micropigmentation in 2002 in the United Kingdom. However, Matt Lulo (ScalpMicro USA), a former employee of HIS, is claiming to potential clients that HIS was the first in the USA and “years before” Artistry Concepts. But in fact Lulo and HIS did not even enter the United States until late in 2011, almost three full years after Artistry Concepts. 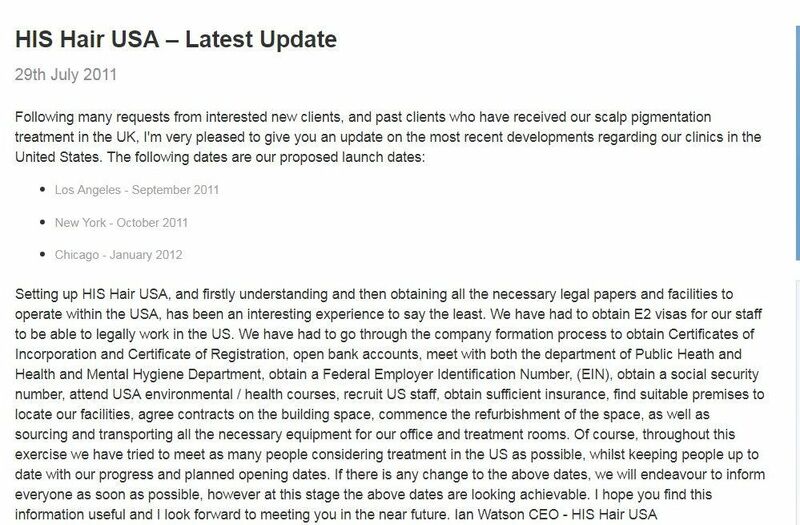 HIS Hair Clinic was only looking into the matter of opening in the USA in July of 2011. Matt Lulo worked for HIS in 2011 when they first entered the USA. HIS Hair Clinic later filed for bankruptcy in 2015. According to HIS, they trained Vinci. ARTISTRY CONCEPTS (now M. Weston Non-Surgical Hair Restoration) was in fact the first company in the United States in early 2009 to openly and commercially offer scalp pigmentation as a full-time business. See Early History and Field Accomplishments. There is no reason to go into further detail. Since HIS Hair Clinic’s filing for bankruptcy in 2015, Weston’s company is now the oldest and longest operating scalp micropigmentation company in the world. 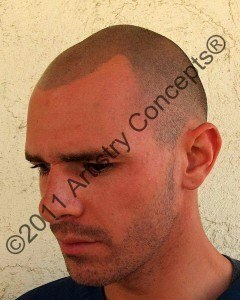 The original owner of Good Look Ink had his scalp pigmentation performed by Artistry Concepts in October of 2009. He sent emails praising the results requesting his before and after photos. We later discovered this was to claim Weston’s work as their own on their new website (which in fact they did). As of recent, GLI claims that they were “born” out of the need to fix Weston’s poor work. If this is the case, why were they stealing photos from us in spring of 2010 and posting them as their own? GOOD LOOK INK claims they were the first. In early October of 2009, a man flew in from Minnesota to Artistry Concepts by the name of Marshall Charloff. Weston performed one of the first ACHM scalp pigmentations on Mr. Charloff. This man returned to Minnesota and a month later he put up the GLI website and incorporated. Mr. Charloff claimed he was the inventor, innovator, etc. and that his company performed his pigmentation which was pictured on his website. For claiming they “invented” scalp pigmentation, GLI felt compelled to remove photos from the Artistry Concepts’ site (and cropping off the AC watermark) in March of 2010 and used them in their own advertising. We were notified numerous times that GLI claimed to be a subsidiary of Artistry Concepts to potential customers. GLI went as far in 2011 to purchase two domain names encompassing AC’s registered trade name which they utilized to confuse internet searchers to redirect them to the GLI website. Artistry Concepts brought legal action against GLI and won the action. GLI even claimed publicly in 2012 that they invented scalp micropigmentation during an appearance on Good morning America. Mr. Charloff was and still is a piano player. In 2014, Mr. Charloff sold GLI to an investor and it is believed that he did not disclose the actual facts to the buyer. As of late, one of GLI’s “national image consultants” Dustin LaFavre, has been libeling Weston on the telephone and through emails in response to customers’ inquiries. We have emails from customers forwarded to us as well as customers that chose The Weston System and disclosed to us the libelous remarks by LaFavre. LaFavre is also claiming to potential clients that GLI was the first provider in the USA and they “invented” scalp pigmentation (contrary to the proof in this paragraph). Ms. Mazzocchi claims (trades under the name of “Bravi”) she “pioneered” scalp micropigmentation in 2011. How is this possible when her own employer at that time had his scalp done at Artistry Concepts in 2009? What’s even more interesting, is that GLI’s employee, Amanda Mazzocchi, who performed the pigmentation procedure on Good Morning America, later left GLI to open her own company and now claims she “pioneered the SMP process” in 2011. SCALP AESTHETICS entered in 2012, with Bryce Cleveland also claiming he is the first and “creator.” Scalp Aesthetics was merely a website in mid 2012 and just attempting to break into this field. 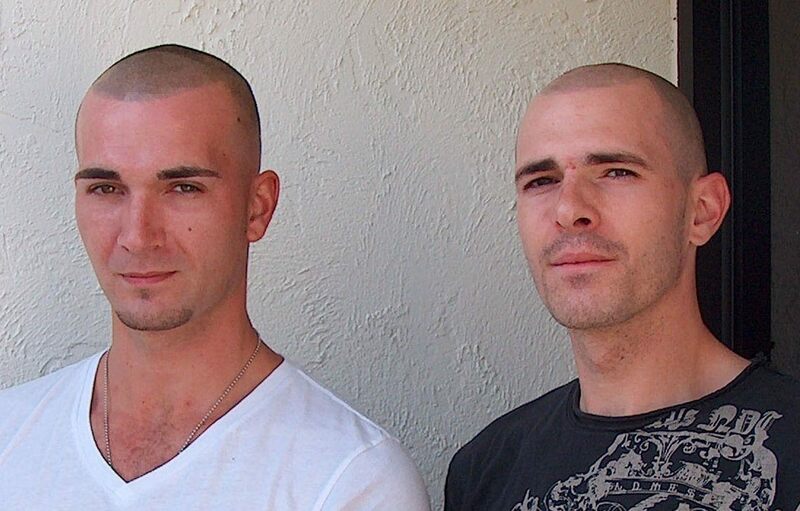 In 2011, Weston brought in a young man whom was a previous client of Weston’s to train in scalp pigmentation. Robert J. Anzalone, worked for Artistry Concepts for about 18 months. Weston started receiving complaints from clients of poor workmanship by Anzalone and that he was also bragging to them that he was going to leave and open his own company. In July of 2012, Weston discovered Anzalone was stealing supplies and was immediately terminated. There was in fact a police investigation. Some of the clients confided in Weston that Anzalone smelled of marijuana when he came back from lunch to finish their application. Weston eventually had to redo 16 men done by Anzalone because of poor workmanship. (See Joe Taylor below). After he was served with a Do Not Compete complaint, Mr. Anzalone fled to Rochester, NY where he was promptly employed by Scalp Aesthetics, assuming under some previously negotiated lump-sum monetary enticement. Cleveland denied that Anzalone worked for him even though photos were supplied by a private investigator for the court. Mr. Cleveland was advised by Weston’s intellectual property counsel that Anzalone executed a Do Not Compete with Artistry Concepts. However, Cleveland denied that Anzalone worked for him even though photos supplied by a private investigator as required by the court proved differently. 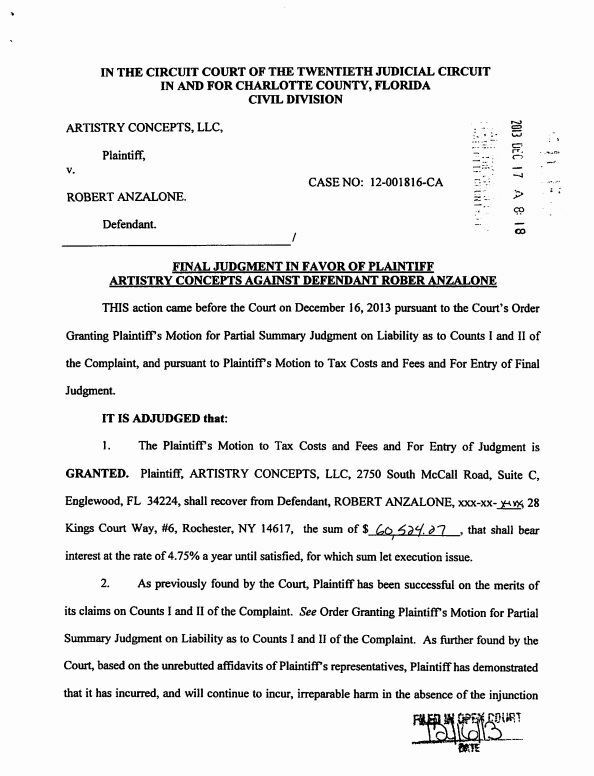 After winning the suit, a worldwide Do Not Compete court injunction was issued against Anzalone. Anzalone (Taylor) claims to this day that Weston attempted to sue him. There in fact was a world-wide court injunction. In addition, Anzalone was ordered to pay for Weston’s court and attorney’s costs for over $60,000. Anzalone (a/k/a/ “Joe Taylor”) left, Cleveland right at the Arizona office. This is the actual court injunction (Final Judgment), even though Anzalone (Taylor) contends that Weston only “attempted” to sue him. Anzalone again fled to the only other Scalp Aesthetics location at that time, which was in Arizona. Bryce Cleveland and Mr. Anzalone decided that Anzalone must work under the alias name of “Joe Taylor.” Anzalone claims he wanted to “break away” from Artistry Concepts; therefore chose this alias, but in fact Anzalone (Taylor) was hiding to void further prosecution under the court injunction. “Joe Taylor’s” Weston System done in 2011. Taylor (Anzalone) claims that a one-session scalp micropigmentation is not possible. Anzalone (Taylor) is presently working in his own company in California still under the alias of Joe Taylor. He claims on his website “10 years experience,” but the math does not add up (perhaps 5 years with Bryce Cleveland). In addition, he does not have one photo of work he has ever done on his website. He also states that “Don’t be fooled by a one time application as this approach is strictly beneficial to the provider and not the consumer.” But Anzalone’s (Taylor’s) own scalp micropigmentation is Weston’s patented one-application method from 2011. Anzalone (Taylor) also claims he trained the “word famous” Jonathan Gerow while at Artistry Concepts. Anzalone (Taylor) was only at Artistry Concepts for a month or two during the term of Gerow before Weston fired him (Anzalone). Training in that short of time is impossible. Anzalone further claims to be the the second-best trainer after Weston, but Weston fired Anzalone for poor workmanship and complaints from customers among other issues. Gerow’s own testimonial from 2010 as it still appears on the Artistry Concepts’ website. Mr. Gerow claims he has 10 years experience and is the “innovator”of scalp pigmentation. Jonathan Gerow (left) and Robert Anzalone (right, later known as “Joe Taylor”) at Artistry Concepts in 2012. JONATHAN GEROW (former owner of Hairline Ink) was another client of Weston’s in 2010. Mr. Gerow was a house painter (Olympic Painting Services) whom after being ecstatic with his scalp pigmentation results by Weston, expressed interest in learning scalp pigmentation in 2012. Hired by Weston in the spring of 2012 during the time Mr. Anzalone was still employed, Gerow was hired as a possible future apprentice and his day-to-day duties were to greet clients, clean the offices and rest rooms and other menial duties. Gerow was only permitted to practice with generic equipment on fake skin when his other duties were completed. He was never trained by Weston. Mr. Gerow provided a statement to police regarding the previously mentioned theft by Mr. Anzalone as above which reveals some very interesting information, which Weston has the recorded statement in Mr. Gerow’s file to this day. It was later discovered that he was collaborating with Anzalone and was terminated shortly after in September of 2012. Mr. Gerow’s personal moral and ethical values were below reproach and questionable and did not meet Weston’s expectations. Jonathan Gerow as seen in January of 2017. His original Weston application remains stellar. It is the contention that Gerow lost more hair and underwent several multi-session applications. These sessions could not match Weston’s needles or pigments. Now Gerow alleges it is being lasered off but in fact it is not Weston’s work, but inferior scalp pigmentations that were done on him recently. As of late, Gerow has complained that his Weston application turned green within six months after his original application in 2010. This photo was taken in June 2012 of Gerow and Anzalone (aka Taylor). Gerow claims that he was the one in fact that left Weston’s employ because he didn’t want to be “associated with a tattoo artist” (but now claims he was a tattoo artist previously himself) and that he (Gerow) had developed and perfected his own more-natural looking hairlines. Mr. Gerow has claimed that he was Weston’s “lead” artist and “partner,” even though he never touched a single customer, never had a Florida Tattoo license, nor completed the required Bloodborne Pathogens course. Mr. Gerow was never trained by Weston nor Anzalone (a/k/a Joe Taylor) and further claims on his website that he has 10 years experience. The math indicates he has perhaps 5 – 5 1/2, if that is even the case. Mr. Gerow continues to claim to his customers that he was trained by Weston in an attempt to gain recognition, but he was not. Mr. Gerow was in fact trained by HIS Hair Clinic sometime in 2013 in the SMP-MS (scalp micropigmentation multiple session) method. This does not add up to 10 years experience. As of late, Gerow has complained that his Weston application turned green within six months after his original application in 2010 and has been living with an inferior Weston application since 2010 and is just now getting it lasered off. Gerow worked for Weston as late as 2012 (two years later) and the application never had color change. Gerow’s allegations of a green/blue head since 2010 are clearly unwarranted and a clear sign of attempting to discredit Weston. It is the contention that Gerow lost more hair and underwent several multi-session applications. These sessions could not match Weston’s needles or pigments. Now Gerow alleges it is being lasered off but in fact it is not Weston’s work, but inferior scalp pigmentations that were done on him recently. Photos of Gerow can be found on the internet since that time, including proudly displaying himself on the original Hairline Ink site and his current website. Weston’s original application has been compromised by Gerow’s various employers and technicians working on him as well as trying to camouflage his additional hair loss with multi-sessions. ARTISTRY CONCEPTS (now M. Weston Non-Surgical Hair Restoration) is clearly the first formal provider in the USA for scalp micropigmentation. Not Scalp Aesthetics, not Good Look Ink, not Jonathan Gerow or Vinci or anyone else that claims to have been the first. Weston has seen dozens of smaller companies come and go over the years, and almost all of the other companies out here now didn’t even think about scalp micropigmentation until 2013 or later. And while these other providers may claim they may have developed specific equipment, needles or method and were the “first,” they have been debunked. Weston was and still is the only person in the world to specifically develop a needle and a one-time application method that has been patented. Weston is presently writing an autobiography about his years in the scalp micropigmentation field with many more specific details of the above events and more that haven’t even been mentioned. 12 thoughts on "Who Started Scalp Micropigmentation in the USA?" Mr. Weston, I have worked at both HIS and SA. While I was employed, I heard your name a lot. We were strongly urged as employees that we were to leave negative reviews and comments on line and leave negative comments on their company owned forums about you. The fact that you have stayed in the industry after everything that I know you dealt with, really is a statement of who you are! I can now be honest, you scare people in the industry!!! Because we know what you have now proved in your video. And both companies wanted to make you “go away” before you made a video like the one you just did. I have left the industry for all the reasons you have spoken about. I really hated how unhappy a lot of the customers were about sitting through the application 4 to 8 times, and having to think of excuses to tell them why they would need another session. I am truly sorry that I was part of all that Mr. Weston. Thank you for the honesty Jules. I have previously contacted a couple of the companies you talk about here, and yes, they claim they were the first or whatever, the inventors, the creators. Thanks for the honest info. I will not do business with any company that knows they are deliberately misleading customers. These companies are a disgrace to SMP. I went to John Gerow and his work faded and he kept charging me to do it over. He had his friends in the room when I was getting done and he was also on his phone in the other hand while he worked on me. Not professional at all. I felt like I was infringing on his personal time. Thank you for your comment J.C. The sad part of what you have just described is the same treatment and outcome that you would get from the multi session companies. It is simple, a single needle will not put in pigment that will stay. If a single needle is used, and the needle is put into the correct depth, it will never stay permanently, no matter how many sessions you have. All of the multi session companies know this, that’s why they are pushing training so hard. They know the multi session method is now starting to die; it has run its course. With training they are promising riches to people, get them to pay for training, then find that what they are doing, does not work… Then, it get passed on to the next unexpecting person, and so on. This is the reason for hundreds of these companies out here right now. But the market is waking up to the reality of multi-session scalp micropigmentation is a racket for a profitable renewable resource of cash. What I set out to do in the first place, to help people with a service that delivers what is promised, will be realized and only ethical people using equipment that is made and patented for the job will be doing the work. Scalp Micropigmentation really is a dirty business Mark and to most companies it’s all about taking your money. In my situation I dealt with the deviants at Scalp Aesthetics who quoted me two different prices and once I accepted the lower price they kicked me to the curb over 500$ but in my eyes that was a blessing. Reason be is because I found you after all I went through. Everything happens for a reason and that’s why. It took me 2 months of waiting to get into to see you. I was truly convinced by everything I saw online and from talking to you on the phone for over 30 minutes at a time. And boy was I right. Only thing needed to be said is you’re simply the only TRUE scalp micropigmentation artist out there and I’m absolutely thrilled with how my head looks. Anyone who reads this please don’t hesitate, pick up the phone and call Mark asap because he will change your life in just one day. Thank you much Mark! I am looking forward to my day in Mark’s chair. I have spoken to him several times on the phone, and I really like everything that he stands for, and who he is as a person. I am looking forward to meeting you, Billy. I have to say that I respect you as a police officer and all you do. Happy you recuperated well from the motorcyle accident. That was some video! I am a 39 year old black male from Alabama who works in a very public profession (Law Enforcement) and has been interested in the possibly of having this procedure done for years but honestly don’t want to make a mistake and choose the wrong procedure and situation for me. There are a lot of options out with so many pros and cons that I have reviewed. After 20 years I have finally built up the courage to seriously look into having this done before my upcoming wedding at the beginning of June and really would like your profession help to see if this is a real option for me. Yes, my patented system would definitely be the best option for you. As this is a one-session only application, you do not have to return 3 – 7 times for additional sessions. You are busy enough with your upcoming wedding and certainly don’t need additional stress or more added to your calendar. I can assure you that you will look fabulous for your wedding! Most of my clientele are first responders; police, fire, EMS/EMT and military personnel. I will contact you directly at your email address and you can contact me back for a personal consultation with me. I did 6 sessions with Jonathan Gerow at a cost of $2700. It looked fantastic for about a month then it’s like the dots fade out and grey out. Let me know your thoughts are and what you think of his work. My wife thinks I should just leave well enough alone and let it fade back to bald. I will tell you that I do Bic my head as Jon never told me not to and you told me otherwise so maybe I contributed to my faded head. But Jon could never give me a straight forward answer. The guy has a seriously bad case of A.D.D. He was always distracted while performing my procedure plus he keeps relocating in NYC. I went to 3 different places and now he moved again. Spent just a few hours with him, but felt like we were great friends by the end of the day! Mark I hope you and the wife are well.